We had a pleasant stroll through the town, which was surprisingly busy with a parliamentary election vote in progress. From Gostivar, we took little known back roads in the wilderness of western Macedonia, driving through the gorge of Radika river. Our first stop was Mavrovo National Park and the man-made lake of Mavrovo. We stopped for lunch in a restaurant overlooking the lake. After the sumptuous meal, we decided to explore the shore of the lake, and the photo opportunities which were hard to miss. We had to hurry, with lots of things to see, and so little time to do it in. The region of Reka and the Radika river was waiting for us. Reka is very well known for their artful craftsmen, mainly woodcarvers and fresco and icon painters. The villages in the region are buried in the lush greenery and have a very interesting history. They started many years ago as Christian villages but with time, under the rule of the Ottomans, most of the villages adopted Islam as their faith. Curiously enough, they retained the churches in the villages to remind them of their ancestry. Ali loved the unusual scenery, and his camera was very active! We visited the monastery of St. Jovan Bigorski (John the Baptist) high in the mountain - good thing the Land Rover was a 4x4! 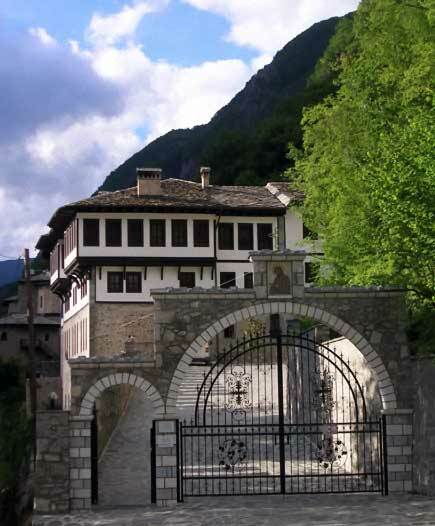 The monastery is one of the most important religious sites for Macedonians. Built as a small church in the late 10th century, it grew and prospered and by the mid 16th century was one of the most important spiritual places for the people of the region. The interesting thing is that, during the rule of the Ottomans, it was the Muslim people from the surrounding villages who would defend the monastery from highway bandits, mainly Albanians from Elbasan and around. From St. Jovan Bigorski, we took to the road to the town of Debar, passing through gorges with many man-made lakes. The road was taking us all the way to the most important and most beautiful place in Macedonia, the city of Ohrid. Ohrid is a city protected by Unesco and is a world heritage site. It is the cradle of Slavic culture, one where the Cyrillic alphabet was born. Cirilus and Metodious were commissioned by the Tsar of Vladislav of Moravia (today's Poland) to devise an alphabet for the Slavic tribes and translate the Bible, thus bringing Christianity to the Slavs. The brothers accepted the challenge, and with their seven disciples, undertook the momentous task. After the death of the brothers in the late 10th century, two of the disciples, Naum and Kliment, returned to their birthplace -Ohrid, and started the first Slavs University in the Church of St. Jovan in the far shores of the lake. There they re-worked the Glagolica, from 43 letters to 31, and re-named it Cyrillic, in honour of their teacher Cirillious (Slavic-Kiril). And thus it was that the Cyrillic alphabet was born! It said that Ohrid has 365 churches, one for every day of the year. Unfortunately only around 160 are standing intact today. Another interesting thing about Ohrid is that it has the only fortified castle in Macedonia, seat of the Macedonian Tsar Samuil. who sat on the throne from the late 10th century, up to the year 1014 when he died. The Citadel is perched on the top of one of the two hills in the old part of the city. The other one has the Church of St. Kliment, witch is the seat of the Archbishop of the Macedonian Orthodox Church.